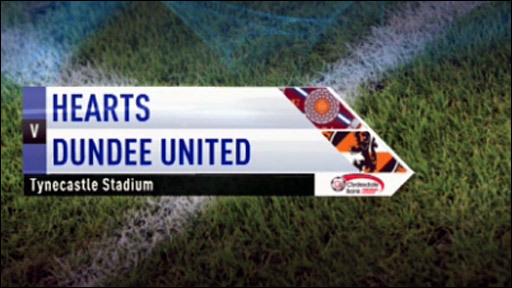 Hearts' hopes of clinching fifth place in the Scottish Premier League and a possible place in Europe all but ended after drawing with Dundee United. The visitors dominated the first half with Craig Conway having two efforts blocked near the line. Andy Webster found the net for United but the goal was disallowed for a foul by the former Hearts man. David Templeton had Hearts' best effort with a fierce drive that was saved by goalkeeper Steve Banks. The Tynecastle outfit can no longer match fourth-placed Motherwell's points tally and Hearts need a three-point swing and a significant turnaround in goal difference to overtake Hibernian. United, having already clinched third place, are assured of qualification to next season's Europa League and victory in the Scottish Cup final for the Taysiders would give the fifth place side passage to the same Uefa competition. Conway's free-kick found the unmarked Jon Daly in the fourth minute, but the striker could not get the ball under control as it trickled back to Hearts goalkeeper Jamie MacDonald. A dangerous low delivery into the United box by Lee Wallace found no takers at the front post in Hearts' first concerted attack. MacDonald appeared hesitant as he touched Garry Kenneth's header wide after the visiting captain had connected well with Conway's corner. Set pieces continued to cause Hearts problems and Daly's glancing header from another Conway free-kick took a nick off a Hearts player and narrowly missed the far post. Conway then got in behind the Hearts defence to latch on to David Goodwillie's lobbed pass and have two efforts at goal. The midfielder stumbled as Ismael Bouzid cut across him but still managed to get a shot away, which MacDonald saved, and Conway's second effort was cleared off the line by Eggert Jonsson. Andy Webster headed into the net from another Conway free-kick but the referee had already blown for a foul by the Dundee United defender. United started the second half as they had finished the first, Goodwillie shifting back and forth to evade Marius Zaliukas only to drag a shot beyond the far post. Having been restricted to long-range efforts in the first half, Hearts finally tested Banks when David Templeton's stinging drive was touched wide by the former Tynecastle keeper. Hearts' Ryan Stevenson then shot high and wide from the edge of the penalty area. A series of substitutions interrupted play as both managers looked for a fresh impetus. In a breakaway attack, Conway played a one-two with Prince Buaben and fired low towards goal but MacDonald made a comfortable save. And there was to be no breakthrough as both sides were forced to settle for a point. 90:00+3:03 The referee signals the end of the game. 90:00+0:26 Inswinging corner taken right-footed by David Templeton from the left by-line, Prince Buaben manages to make a clearance. Inswinging corner taken right-footed by David Templeton, Ismael Bouzid challenges David Robertson unfairly and gives away a free kick. Free kick taken by Steve Banks. 87:06 Corner taken right-footed by David Templeton from the left by-line, Garry Kenneth manages to make a clearance. 81:56 Sean Dillon takes the direct free kick. 81:56 Booking Eggert Jonsson is shown a yellow card. 81:51 Free kick awarded for an unfair challenge on Jon Daly by Eggert Jonsson. 78:20 Jamie MacDonald takes the free kick. 78:20 Substitution Gary Glen replaces Ryan Stevenson. 78:20 Substitution Jason Thomson is brought on as a substitute for Suso Santana. 78:20 Craig Conway is flagged offside by the assistant referee. 75:48 Marius Zaliukas takes the direct free kick. 75:48 Booking The referee cautions Daniel Swanson for unsporting behaviour. 75:45 Daniel Swanson gives away a free kick for an unfair challenge on Ismael Bouzid. 74:19 Inswinging corner taken right-footed by David Templeton. 72:10 Substitution Jennison Myrie-Williams replaces Scott Robertson. 70:01 Suso Santana crosses the ball in from the free kick, clearance made by Prince Buaben. 70:01 Booking The referee cautions Scott Robertson for unsporting behaviour. 69:58 Calum Elliot fouled by Scott Robertson, the ref awards a free kick. 68:26 Craig Conway fouled by Suso Santana, the ref awards a free kick. Strike comes in from Craig Conway from the free kick, Jamie MacDonald makes a save. 66:39 Shot by Ryan Stevenson from outside the area goes high over the crossbar. 64:20 Shot by David Templeton. Steve Banks makes a save. Inswinging corner taken by David Templeton from the left by-line, Steve Banks makes a save. 63:10 Free kick crossed by Craig Conway. 63:10 Booking The referee shows Ismael Bouzid a yellow card for unsporting behaviour. 63:09 Foul by Ismael Bouzid on Craig Conway, free kick awarded. 58:49 Substitution David Goodwillie leaves the field to be replaced by Andis Shala. 58:49 Effort from the edge of the area by Daniel Swanson goes wide of the right-hand upright. 58:15 David Goodwillie is flagged offside by the assistant referee. Lee Wallace takes the indirect free kick. 56:24 Shot by David Goodwillie from deep inside the penalty area misses wide to the left of the target. 53:08 Substitution (Hearts) makes a substitution, with Gordon Smith coming on for Ian Black. 52:23 Free kick awarded for a foul by Sean Dillon on Suso Santana. Free kick crossed by David Templeton, save by Steve Banks. 51:19 David Goodwillie produces a right-footed shot from just outside the area that goes wide left of the goal. 50:35 David Templeton concedes a free kick for a foul on David Goodwillie. Free kick taken by Sean Dillon. David Goodwillie is flagged offside by the assistant referee. Lee Wallace restarts play with the free kick. 45:01 Substitution Daniel Swanson joins the action as a substitute, replacing Andy Webster. 45:00+0:54 The half-time whistle blows. 45:00+0:07 Free kick awarded for a foul by Craig Conway on Calum Elliot. David Templeton crosses the ball from the free kick right-footed from right wing. 42:22 Short corner taken by Calum Elliot. 40:27 Effort on goal by Ian Black from just inside the penalty box goes harmlessly over the target. 38:42 Foul by Ismael Bouzid on Craig Conway, free kick awarded. Craig Conway delivers the ball from the free kick right-footed from left wing, Unfair challenge on Marius Zaliukas by Andy Webster results in a free kick. Jamie MacDonald takes the direct free kick. 35:48 Corner taken by Craig Conway from the right by-line, Marius Zaliukas manages to make a clearance. 30:57 Free kick awarded for a foul by Ian Black on Craig Conway. Craig Conway crosses the ball in from the free kick, clearance by Ismael Bouzid. Outswinging corner taken by Craig Conway from the right by-line. 29:05 Inswinging corner taken by David Templeton. 26:18 The assistant referee signals for offside against David Goodwillie. Indirect free kick taken by Jamie MacDonald. 23:10 David Templeton has shot on goal from just outside the area which goes wide of the right-hand upright. 21:41 Corner taken right-footed by Craig Conway from the right by-line, Lee Wallace makes a clearance. Corner taken by Craig Conway from the right by-line played to the near post, Ismael Bouzid manages to make a clearance. 20:55 The referee blows for offside. Indirect free kick taken by Steve Banks. 19:08 Free kick awarded for a foul by Eggert Jonsson on Craig Conway. The free kick is swung in right-footed by Prince Buaben, save by Jamie MacDonald. 16:15 David Goodwillie concedes a free kick for a foul on Ismael Bouzid. Eggert Jonsson takes the free kick. 14:54 Outswinging corner taken by David Templeton, clearance by Garry Kenneth. 13:08 Ian Black produces a right-footed shot from deep inside the penalty box which goes wide of the left-hand upright. 12:28 The referee blows for offside. Free kick taken by Jamie MacDonald. 11:34 The offside flag is raised against Ruben Palazuelos. Steve Banks takes the free kick. 8:20 Unfair challenge on David Templeton by Scott Robertson results in a free kick. The free kick is delivered right-footed by David Templeton from right wing, Jon Daly makes a clearance. 4:33 Corner taken by David Templeton, free kick awarded for an unfair challenge on Steve Banks by Marius Zaliukas. Steve Banks restarts play with the free kick. 3:27 Ian Black challenges David Goodwillie unfairly and gives away a free kick. Free kick crossed right-footed by Craig Conway from right channel, save by Jamie MacDonald. 1:35 Ismael Bouzid gives away a free kick for an unfair challenge on David Goodwillie. Direct free kick taken by Sean Dillon.